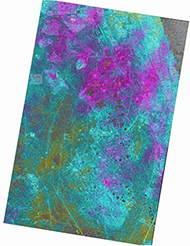 Airbus Defence and Space and Hisdesat Servicios Estratégicos, S.A. have generated the first joint TerraSAR-X / PAZ Radar Interferogram. This milestone demonstrates the missions’ capacity for cross-sensor interferometry, whose processing is among the most challenging. Flattened TerraSAR-X/PAZ cross-interferogram (geocoded) over Burgan Oilfield, Kuwait Interferograms are typically used to derive the topographic elevation and deformation of the Earth’s surface, and are created using at least two different images acquired at different date. This flattened Cross-Sensor-Interferogram has been created from a mixed image pair with 4 days temporal separation acquired by TerraSAR-X and PAZ (StripMap scenes from 22 and 26 November 2018). The area covers the oil and gas production site Burgan (Kuwait) and parts of the Persian Gulf. The oil field is the world largest sandstone oil field with the total surface area of about 1,000 km².